Mark your calendars – the Portland Modern Home Tour! On Saturday, June 4th, the 2016 Portland Modern Home Tour will give area-residents the rare opportunity to explore eight incredible modern homes in the City of Roses and meet the local architects behind the designs. Modern Home Tours also welcomes the Architecture Foundation of Oregon as the tour’s non-profit partner for the first time. Welcomed as a new addition to the tour this year is the support of the Architecture Foundation of Oregon. They will help staff the event, in return for a donation and the opportunity to use the tour as a fundraising vehicle. For a second year in a row, take a walk through a (different) floating home that lies on the Willamette River in the Sellwood area of Portland. Designed by Integrate Architecture & Planning, p.c., the first floor of the home is an open plan with clear site lines all the way through from east to west. The entry is angled in plan toward the south to be easily visible from the community walkway while also providing a playful geometry which engages the guest. Plants in the solarium, off of the kitchen, provide an interactive privacy for the home and community. The stair walls are fluted glass block, which provide natural light and privacy. …Participating homes in the 5th annual Portland Modern Home Tour will open their doors for viewing from 11AM – 5PM on Saturday, June 4th, in the Portland, Oregon area. All are invited to attend. Tickets for each tour are $35 in advance online; $40 on the day of the tour. An after-party will be open to all tour-goers after the tour at a location and time TBD. For details on all participants and to buy tickets, visit: http://modernhometours.com/event/2016-portland-modern-home-tour. Additional promotional considerations are offered by Gray Magazine and The Oregonian/Oregonlive.com. http://www.altpdx.com/wp-content/uploads/2015/06/logo-trans.png 0 0 Colleen Glaab http://www.altpdx.com/wp-content/uploads/2015/06/logo-trans.png Colleen Glaab2016-05-25 20:32:372016-05-25 20:32:37Mark your calendars - the Portland Modern Home Tour! Plans are underway for another eight-story building in downtown Portland. But it’s not a new condo, or office tower – it’s a school. Many of Portland’s recent boundary changes aim to relieve overcrowding at Lincoln High School in downtown. But long-term, the district wants Lincoln to be bigger. The problem is that Lincoln is on a small piece of property. So, as the district’s capital projects director Erik Gerding explained, the plan is to build up. “What would be considered the kind of ‘classroom tower’ so to speak is approximately eight stories. At this level of design, the master plan is kind of a big picture look, so the number of stories could fluctuate,” Gerding said. The plan could include a new elementary or K-8 school on the Lincoln site. Gerding said it would be the state’s first high-rise high school. The district design team is visiting Chicago this week to see one. The district has not published any cost estimates for rebuilding Lincoln, but officials plan to present those at a meeting of the school board’s bond committee next week. The whole story and another sketch can be found HERE on OPB’s website. Oregon’s unusual and complicated property tax system puts the brakes on how much your bill can grow each year, but it also allows for unavoidable and unexpected exceptions to the rule. Housing reporter Luke Hammill recently explained some surprising changes in tax bills for residents of Portland’s Lents neighborhood between 2014 and 2015. You may know that unlike in other states, changes in real market values don’t always correspond directly to changes in Oregon property tax bills. Check out the whole story HERE on The Oregonian’s website. http://www.altpdx.com/wp-content/uploads/2015/06/logo-trans.png 0 0 Colleen Glaab http://www.altpdx.com/wp-content/uploads/2015/06/logo-trans.png Colleen Glaab2016-05-16 17:18:222016-05-16 17:18:22Portland Property Taxes Mapped! A steering committee has picked light rail to link downtown Portland and Tigard, and opted to ditch a plan that would have called for a tunnel to serve Portland Community College’s Sylvania campus. The selection follows a likeminded recommendation earlier this month from planners at the Metro regional government. The planners said light rail would cost less and cause less congestion because it could operate with fewer vehicles than the high-capacity bus service they had also considered. And in the long term, the bus service couldn’t keep up with anticipated growth, the planners said. Light rail, however, can’t climb the steep hill to access the hilltop college campus. A tunnel, like the one that serves Washington Park in Portland, would have made that possible — but increased the project cost by an estimated 21 percent. The light-rail project is expected to cost $2 billion as currently imagined. A final route hasn’t been determined, but it would likely follow Southwest Barbur Boulevard for much of the route. The whole article can be found HERE on The Oregonian website. The whole story can be found HERE on The Portland Observer website. In Portland’s Eliot neighborhood, a cycling-centric apartment building is wrapping up construction along Northeast Cook Street. The mixed-use, 206-unit Cook Street Apartments is the largest complex in the North Williams Corridor and borders North Williams Avenue, a bike route that connects commuters over the Broadway Bridge directly into the City Center, about two miles away. … Cook Street Apartments was developed by Lake Union Partners, designed by LRS Architects and built by Sierra Construction. Its neighborhood is one area that has become more economically valuable than in the past due to its proximity to downtown. Even though the site is on a bike route directly into downtown Portland, and zoning doesn’t require developers to build parking lots, Cook Street Apartments has parking for 146 cars and 252 bikes. 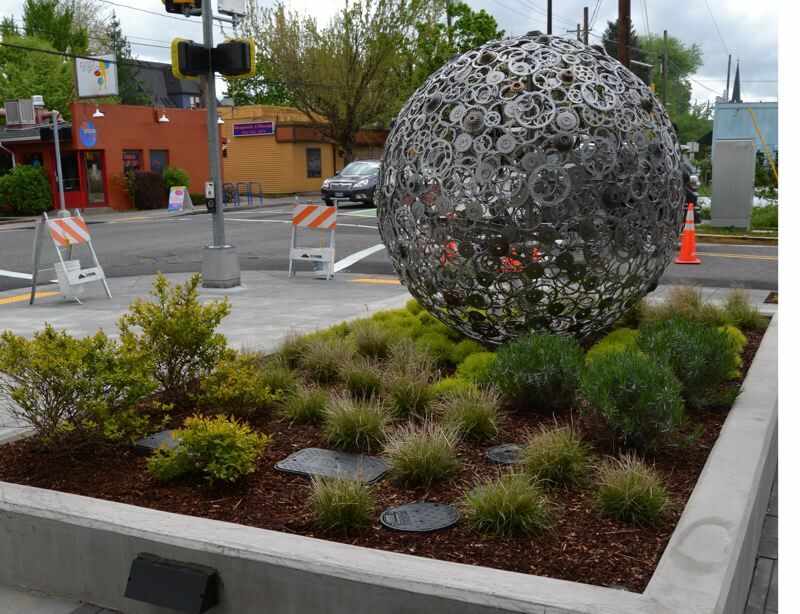 JULES ROGERS – The sculpted orb, made from bicycle gears, represents the cycle-centric buildings amenities and location. The total project cost $30 million, including a little grant money from the Energy Trust of Oregon to add efficient lighting and low-flow water fixtures. At the peak of construction more than 140 workers were onsite, according to Rieck. The U-shaped building cradles an above-ground parking lot roofed by metal racks that will soon be covered in growing vines. Handpainted murals of historical architecture in the neighborhood adorn the enclosed street-level parking lot. … The market-rate units range from $1,270 for a small studio to $2,575 for a spacious two-bedroom. Thirteen of the units are already leased. The entire story can be found HERE on the Business Tribune’s website. … At first, buyers didn’t want to look east of Northeast 57th or Southeast 60th avenues, Brennan said. Then, it was 82nd Avenue. Now, buyers are happy as long as they’re west of Interstate 205. The same thing has happened on the city’s southern fringe. … It’s very common for homes to be on the market for less than a week. In Northeast Portland’s Sabin neighborhood, the median number of days on the market for the 71 homes that sold in 2015 was five, according to data provided by Redfin. The $595,000 median sale price there represented a 28 percent increase from the year before, third-highest in the region. … As tough as Portland’s market is for home buyers, it might be even worse for renters. The latest biannual report from the rental industry group Multifamily NW found Portland’s rental vacancy rate was below 3 percent late last year. In close-in east side areas, average units were vacant for less than 12 days. **Several paragraphs were omitted from the original article. Check out the whole story HERE, on the Oregonian’s website. Curb too close? Dump too far? Click the link HERE for the cleanup calendar and the fine print, brought to you by SE Uplift.